A Leading Micro Finance Industry Client Leverages Customer Lifetime Value Prediction to Improve Customer Retention Strategies. 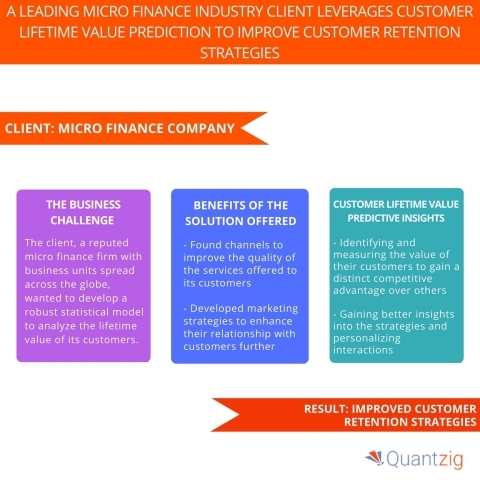 LONDON--(BUSINESS WIRE)--Quantzig, a global analytics solutions provider, has announced the completion of their latest customer lifetime value study on the microfinance industry. A reputed microfinance firm wanted to reach out to a broader customer base with the help of active marketing strategies that are aimed at improving customer relationships. The microfinance industry has been successfully addressing the needs of the increasing population by considering the lower sections of the society and providing services that would benefit them. Despite such firms operating in the market space, most of the micro-financing operations take place in emerging nations, such as Indonesia, Serbia, and Honduras. Also, the rise in the number of credit providers across economies has grown due to the growth of the microfinance sector. Request a free demo to see how Quantzig’s solutions can help you. The solution presented by Quantzig helped the client to improve their relationship with customers and reduce attrition levels by targeting the right customers. The client was able to build a healthy statistical model to examine the lifetime value of its customers. The client wanted to develop a robust statistical model to analyze the lifetime value of its customers.